(November 2016) PianoArc announces the shipping of our latest circle to Cosmo Music in Toronto Canada. Keyboard Department Manager John Ebata is overseeing the introduction to North America’s largest music store. The latest PianoArc is an evolution of all that has come before it – with many ideas spurred by the insights and product expertise of John at Cosmo. First circle made from 4, 72-note modular sections which makes the unit convertible into our Dual Wing design. One touch control of MIDI Zones. Configure the circle from 3 to 16 separate MIDI channels with one touch. 12 (that’s right twelve!) 1/4″ pedal inputs. 6 for Continuous Controller (Expression, Volume, Breath Control) and 6 On/Off (Sustain, Patch Change Up & Down). LED/Light Show control. 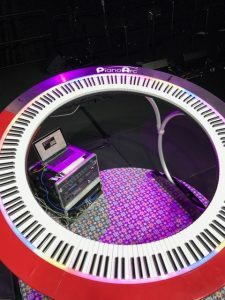 Each of the 288 notes on the PianoArc has it’s own dedicated multicolor (programmable) high intensity LED – and the new Super G Box allows control ranging from completely off, to on when played, to “light show mode” where the colors pulsate and swirl along with the player’s performance. Additional USB power. Powers your phone/tablet, sheet music reader, sound module etc. First unit shipped to a prominent, national dealer. Cosmo, through John Ebata, will handle all Canadian sales for PianoArc. First unit to feature new XYZ controller pads (more on this soon!). First two-color circle (the 4 sections in SN5 can be moved around the circle in any order, without effecting the settings for MIDI etc). 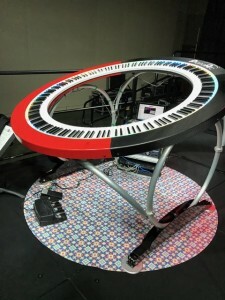 PianoArc is breaking pushing the curve as it relentlessly builds instruments that blur the lines between musicality, technology, design and performance expression. To learn more about PianoArc – please feel free to contact us. In Canada contact: Cosmo Music. 905-770-5222 or toll free 1-800-463-3000. Heading to NAMM 2017, booth 4812 with new goodies.